The birth of a child brings great joy to a mother and father, and to the whole Church! At the Cathedral of St. John the Baptist we are delighted to be able to assist parents in the celebration of a child’s life and in preparation for a child’s Baptism. God gives life to a child, and through Jesus Christ His Son, and by the power of the Holy Spirit, and with the ministry of the Church, calls that child to eternal life through the Sacrament of Baptism. A newborn child should be baptized within the first few months of life. A child who has reached the age of kindergarten should receive some basic instruction/preparation before reception of the Sacrament. 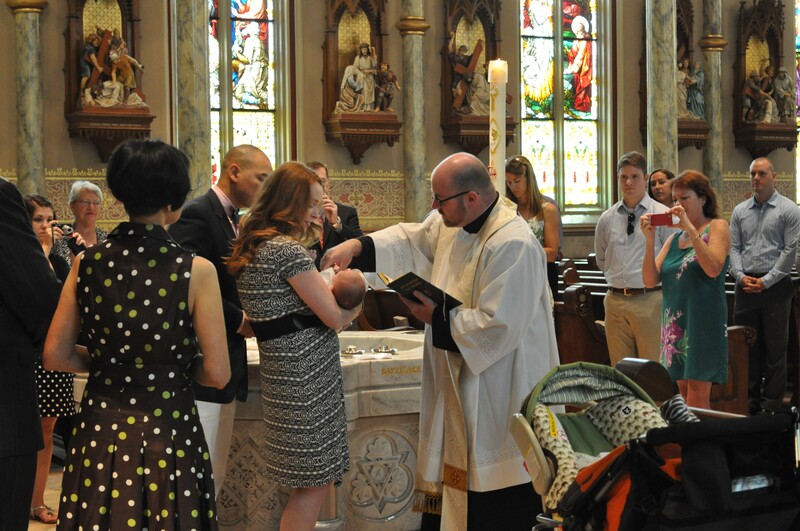 In order to have a child baptized at the Cathedral, at least one parent must be a practicing Catholic, and registered in the Cathedral Parish (or in another Catholic Parish within the Diocese of Savannah). Parents are asked to attend a Baptism Preparation Class which lasts approximately one hour. Classes are held every six weeks and parents are asked to call the Parish Office to register. Baptisms are normally celebrated on Sunday morning following the 8:00 AM Mass. Baptisms can be arranged at other times, when possible, to accommodate the presence of out of town family members. Upon completion of the Baptism Preparation Class, a Baptism can be scheduled by calling the Parish Office. A child to be baptized should normally have two Godparents, a male and a female. In order to serve as a Godparent, a person must be a practicing Roman Catholic, fully initiated, and at least sixteen years of age. A Godparent must supply a letter from his/her proper pastor indicating suitability to serve as a Godparent for Baptism. Once a Baptism has taken place and the information recorded on the Cathedral’s Baptism Register, a certificate of Baptism will be mailed to the parents. The origin and foundation of Christian Baptism is Jesus. Before starting his public ministry, Jesus submitted himself to the baptism given by John the Baptist. The waters did not purify him; he cleansed the waters. Jesus’ immersion in the water is a sign for all human beings of the need to die to themselves to do God’s will. By commanding his disciples to baptize all nations, he established the means by which people would die to sin—Original and actual—and begin to live a new life with God (USCCB). For an adult who has never been baptized (Catechumen), who wishes to become a Catholic, he/she would become part of the RCIA (The Rite of Christian Initiation of Adults). It is a year-long program of instruction in the teachings of the Catholic faith, and a deepening of one’s conversion to life in Christ. At the Cathedral, our instructions begin each year in mid-September and continue through the following Easter. At the Easter Vigil Mass, an adult would be Baptized, Confirmed and receive the Holy Eucharist, thus becoming a fully initiated Catholic.